One of Matt Wallace's fondest childhood memories is of being woken by his father to see Neil Armstrong take the first moon walk July 20, 1969. The moment would have a lasting impact on the 7-year-old's life. "I grew up in time of tremendous exploration. Whether it was NASA, Apollo or 'Star Trek,' there were so many exciting things associated with space exploration," said Wallace, who is the mission manager for NASA/Jet Propulsion Laboratory's Mars Exploration Rover Opportunity. Opportunity is half of an $835 million project that has been exploring the Red Planet since landing in January. Its identical twin is Spirit. The rovers, the size of golf carts, were designed to probe Mars for evidence it once might have been a warmer, wetter place conducive to life. The rovers are expected to last at least through September  they were originally expected to function for only 90 days. Wallace, of Stevenson Ranch, is in charge of the team of nearly 75 engineers who keep Opportunity running during its mission. Opportunity is currently driving around a large crater rimmed with rocky cliffs that may have formed long ago in a salty ocean. The rover is scheduled to spend the next several weeks circumnavigating the crater along a counterclockwise route and photographing its gaping interior from multiple angles. Eventually, Wallace said, the rover may be sent into the crater, if it's determine it's safe and that the rover can drive out of the crater. Growing up on the East Coast, Wallace said he knew he wanted to be involved in space exploration from the moment he watched Armstrong take his first steps on the moon. Not wanting to do the same thing as everyone else after high school and having a desire for military service, Wallace attended the United States Naval Academy in Annapolis, Md. After earning a degree in engineering, he spent five years in the Navy as an officer onboard an $800 million nuclear submarine. "It was terrific. I was young and did not have a lot of commitments yet, so it was a good thing to do at that point in my life," he said. Following his stint in the military, Wallace moved to Pasadena to earn a master's degree in electrical engineering at California Institute of Technology. "I was still interested in getting involved in the space program and I knew I needed to go back and sharpen my engineering skills," he said. "It had been so long since I had (done any) real academic work. When I started graduate school, I had never used a personal computer. It took all the effort I could muster to get through. But I did well." 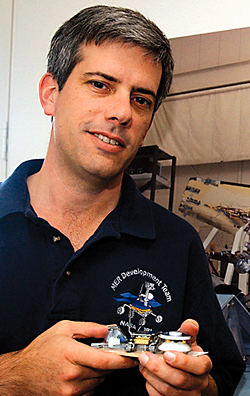 After graduating, Wallace went to work at JPL in 1991. 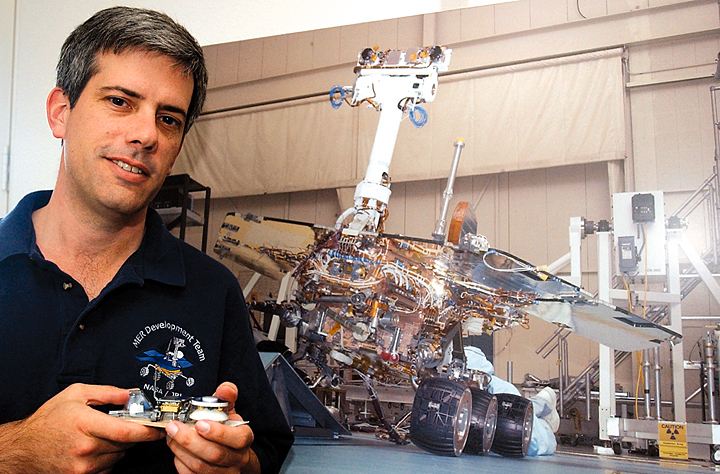 In addition to working on the Mars Exploration Rover program, Wallace has worked on NASA's Cassini-Huygens spacecraft mission to Saturn and the Mars Pathfinder mission, which landed on the Red Planet on July 4, 1997. Wallace said the greatest moment in his career, so far, was listening to Opportunity land on Mars in January. "The first landing (of the Spirit rover) was exciting, but to get two vehicles down on the surface of Mars, that was something else," he said. "To be part of the team that did that, I felt that was something everyone should be excited about."